The What: At InfoComm 2017, Draper (booth 3342) will debut Motorized FlexShades, a new line of commercial window shades. Known as a manufacturer of projection screens and projection and flat-panel display lifts, Draper is taking aim at the needs of AV integrators with the introduction of this new product category. 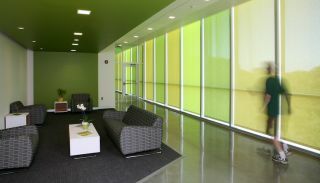 The What Else: Available in a variety of decorative fabrics, the Motorized FlexShades range in size from 2 feet wide to 14 feet wide, with larger sizes available with the FlexShade 2 or Colossal FlexShade. A notable feature of FlexShades is their compact, tubular gearmotors located within each shade for smooth, reliable operation, and the ability to retract completely when not in use for an unobstructed view. The line features a variety of installation options, including endcaps, simple mounting brackets, fascia, and complete extruded pockets with bottom closure panels.